Ticketor in the news / press releases! Revolutionary White-Label Ticketing Platform enables anyone selling tickets to quickly establish their own Branded ticket selling website. LOS ANGELES, CALIFORNIA, February 6, 2015, Anyone who sells tickets will be thrilled to learn about Ticketor’s game-changing white-label ticket selling platform. Ticket sellers of all sizes can now have their own branded website, and be in control every step of the way. This includes using their own Domain Name, Logo and Design and payment processor. 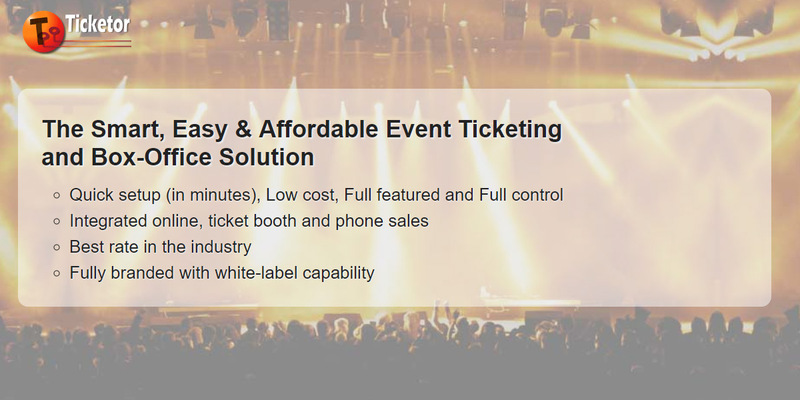 The way Ticketor platform is set-up, allows event planners to get access to the sales money as tickets sell and before the event, as opposed to going through a 3rd Ticketing System where the ticket seller receives their money after the event. Event planners on Ticketor have full control over everything, including: service charges, delivery fees, etc. While all 3rd party ticketing systems have their own set fees and the event planner has no control over them. By using Ticketor and adjusting the charges, the event planner can set it up so that the end-user pays all the ticketing costs. It is even possible to set higher charges and make money out of ticketing and still keep the end user charges lower than 3rd party systems. Ticket buyers will have the option to print their tickets at home and save time and money. All e-Tickets are printed with the user’s logo and branding and are secured by barcodes. e-Tickets can be validated for duplicate and fraudulently generated tickets using any smartphone and a barcode scanner. Ticketor offers many advanced features not found on the 3rd party sites, such as a powerful Seating Chart Designer that allows the planner to build the seating chart for almost any type and size of venue, such as amphitheater style, round-table dinner style or any mixture and the buyer can pick their seat on the interactive seating chart. Ticketor builds the website or adds a ticketing section to an existing website in less than fifteen minutes and at unbelievably low cost. It is now a simple matter to set up events and tickets, build seating charts, do marketing, get live real-time reports, print and validate e-Tickets, and more. The site has a goof-proof Designer Tool enabling even a novice, to simply select a theme and layout, upload a header, logo and background image and edit the content, and within a matter of minutes, a professional-looking website is ready to go.